Today we're continuing to look at dolls with the Drowsy head mold. 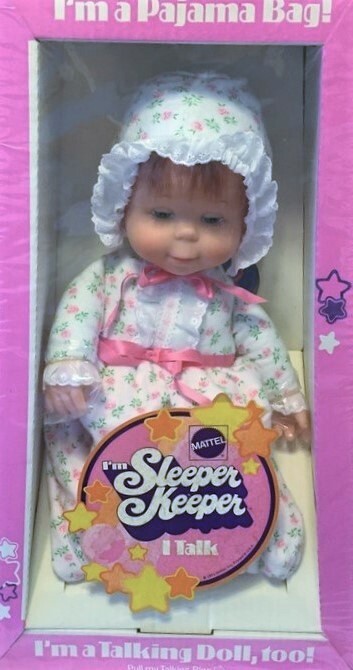 This doll is the Sleeper Keeper. The Sleeper Keeper, (Yes. That's actually he only name she has. 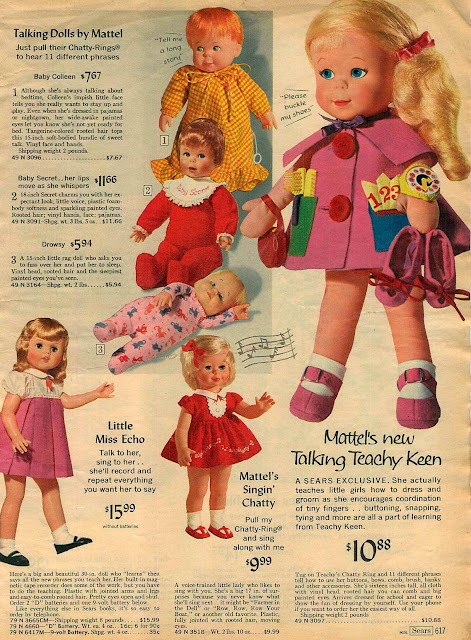 ), was made by Mattel using the Drowsy head. This is what she would have looked like in her box. She should have a bonnet,and a ribbon on her nightgown,which mine is missing. She has not only the Drowsy face but her hands too. She had severe bed head, so I wet combed it to try to make it lay down. I wasn't entirely successful. She's another that I haven't gotten around to taking apart and cleaning yet. She has a talk box in her chest, so she'll have to be unsewn,and have her talk box removed, before she can be thoroughly cleaned. Her pull string ring is on her neck. My doll does still talk. I'm not sure this is her original ring. I've never seen a red one before. I have seen her listed as 1964,1965,and 1971. There doesn't seem to be a year on her tag. But the artwork on her box would suggest the 1971 date is accurate. As she proudly proclaims on her box,she's a pajama bag and a talking doll. As a pajama bag, she has no body beyond her chest. Her nightgown is empty,to hold,what else? Pajamas. The flannel night gown is lined in pink cotton. There was originally a drawstring in the bottom to keep the pjs inside. Let's go to sleep now. May I have your pajamas now? I want to sleep next to you. Hi! I'm a pajama bag! Ok, so she's a little obsessed with being a pajama bag. She has the same face as Drowsy,but her sleepy eyes are a sea green instead of blue. But the difference that made me want her was, she's like having a Drowsy with red hair! Baby Colleen, top left corner. I'm pretty sure that Teachy Keen,on the right, also uses the Drowsy head. ..or the even more rare doll we'll see tomorrow. See you then.